How to Refer a Student to Early Alert? 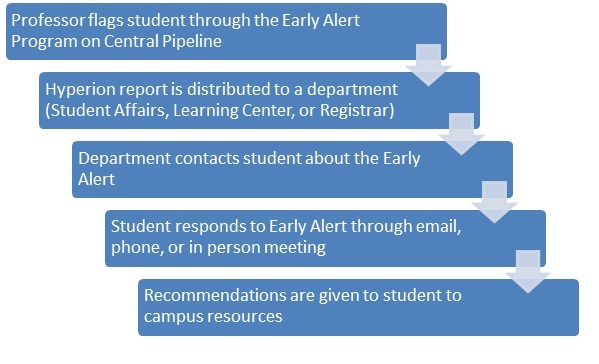 Faculty members can refer students to the Early Alert program through their Faculty/Staff Central Pipeline account via the CCSU website (see link to full instructions below). 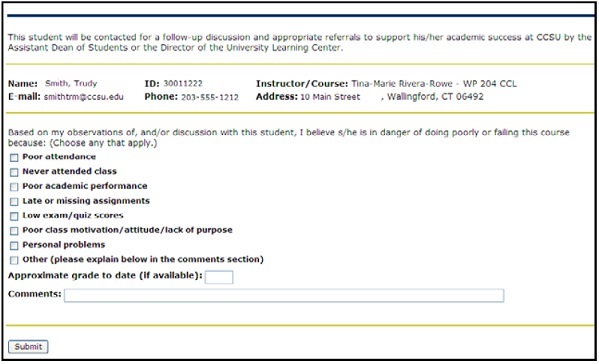 Under the "Faculty Services" tab, select "Early Academic Warning"
Once a faculty member submits an Early Alert referral, the student's information will be sent to the Registrar's Office, Student Affairs, or the Learning Center based on the reasons the student was flagged. A representative from one of these departments will contact the student to connect that student with the support and resources they need. Early Alert representatives contact students first by email and then via postcard home to encourage them to seek academic and personal support. The Early Alert Coordinators do their best to keep faculty members in the loop when working with students.